Use Minecraft for education, citizen engagement and participatory design. Minecraft is a great tool to involve and engage an incredibly large and very diverse group of people – especially among children and young people. Users interact with other users but also with the geography itself, when geospatial data are released as worlds in Minecraft. In other words, the game turns into a geosocial media. Minecraft is a digital game about breaking and placing blocks. It can be played alone and offline or online together with other users. You can play in survival mode, where you have to fight monsters. Or you can play in creative mode, a peaceful mode that allows you to build and move around without being attacked by creepers and monsters. The greatest benefit when using Minecraft for real-world projects is the large user community, which can be engaged with very little introduction. It is often difficult to handle user-involvement and -engagement in urban or rural planning. Especially when it needs to address and engage children and young people. But this challenge can be solved with Minecraft. Because of Minecraft’s huge user base, users with local knowledge and interest will join in and take part as soon a new server with a version of the real world in Minecraft is opened. 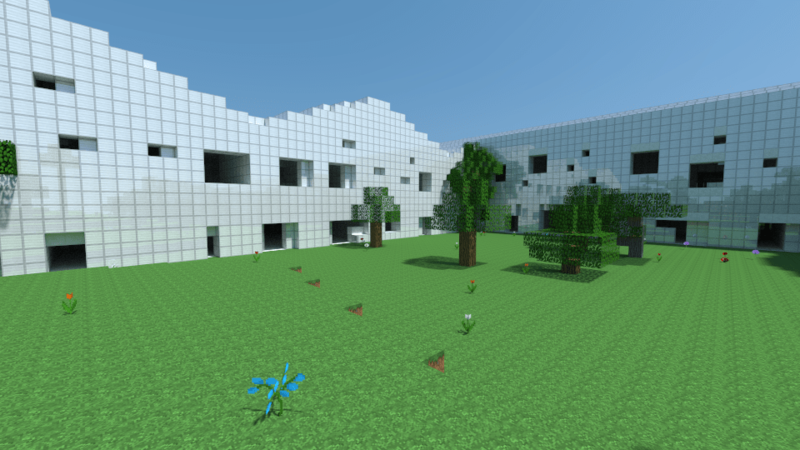 For instance, local children can be invited to visit a Minecraft-model when a new school is planned. In the model they can build their version of the surroundings, the playground or eg. the sports fields. The images show plans for a new school in Odder, Denmark, where children were invited to participate in the indoor decorations. 3D architectural data from: CEBRA Architects. The city of Stavanger as it is planned. Planned buildings are shown in white between existing buildings. All around the globe Minecraft is being used for game-based learning in geography, history, mathematics, democracy and cultural exchange. With the release of Minecraft: Education Edition Microsoft is dedicated to bring the game into schools all around the globe. And thousands of teachers have already joined with their classes. In GeoBoxers, we also see increasing interest among students, teachers and publishers for game-based learning. Minecraft is key to the realization because of its common creative platform and its enormous crowd of users, its flexibility and ease of use. Real geodata in Minecraft further enables the use of game-based learning in geography, for virtual excursions, lessons in urban planning, history lectures etc. Geodata in Minecraft can be used in tourism to show cities and landscapes in 3D in an unusual way. Signs can be set up in game to tell the story of sights and landmarks. And you can have competitions that reward the best looking and most lifelike arrangement of cultural sights. You can also create treasure hunts where tips and hints are found in the Minecraft world, and the treasures are found in the real world. In consequence, Minecraft can be used not only to draw attention to a location, but it can also be used before, during and after visits to locations in the real world. 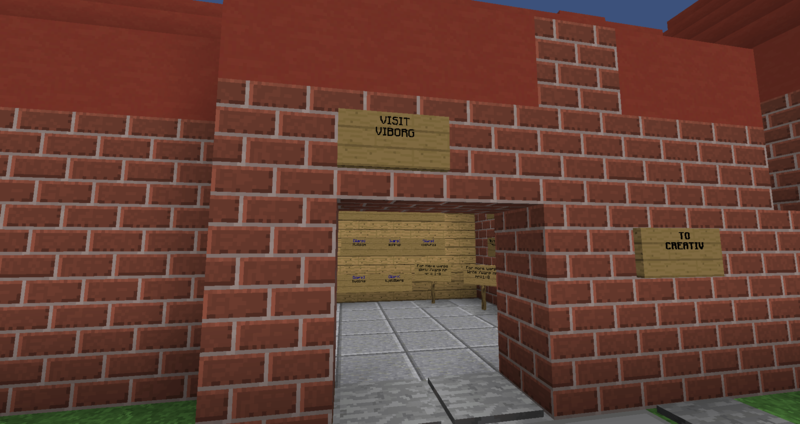 In Vibcraft (the city of Viborg in Minecraft) the tourist office is used as a “hub” connecting sights and places. From VisitViborg every user can warp around in Vibcraft. The large number of registered users of Minecraft is one reason why using the game is so effective when promoting cultural events or civic initiatives is. If the game is involved, it will immediately create attention and curiosity, and when combined with use of social media Minecraft projects will be boosted further. Gamification: “The application of typical elements of game playing (e.g. point scoring, competition with others, rules of play) to other areas of activity, typically as an online marketing technique to encourage engagement with a product or service”, Oxford Dictionaries. Viborg, a Danish municipality of 94.000 citizens, launched “Vibcraft” to be used for citizen involvement in urban planning, education and tourism in the autumn of 2014. The interest was overwhelming: After the first two weeks Vibcraft had 1400 unique users, over 100,000 visits of Vibcraft postings on Facebook. And the Vibcraft website became the most visited website in a single month in Viborg municipality. Ever. From 4000 billion Minecraft blocks covering the whole of Denmark to one single building measured by drones and modeled in 30 cm blocks, GeoBoxers have solid experience with all kinds of geospatial data sets in all scales. We regularly post articles about our work in the News section, so subscribe to get the latest updates. 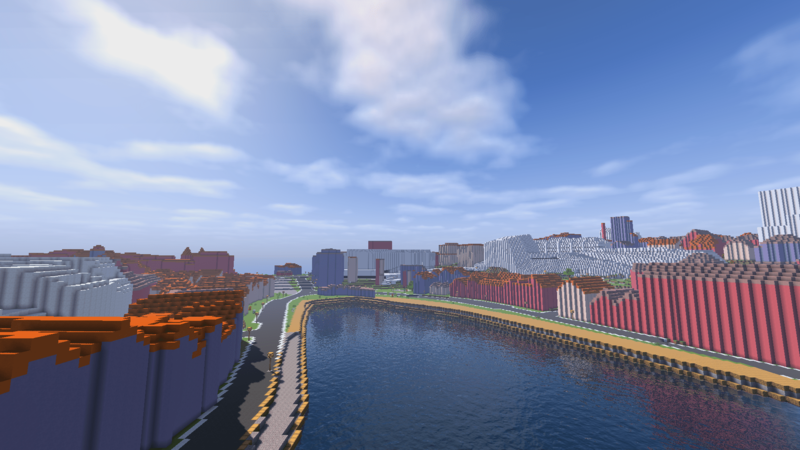 Stavanger, a municipality in Norway, decided to have the city built in Minecraft. The model of Stavanger was used to involve children and young people in planning the future for the city. All available data were used; terrain model, GIS data and digital 3D architectural data. The municipality of Viborg provided GeoBoxers with a 3D city model, information on building materials, geological data and agricultural data. These data were used in addition to the free basic data in “Denmark in Minecraft” to create Viborg in Minecraft. 3D laser scans of the old limestone mines were added to create the world’s largest limestone mines in Minecraft. https://www.geoboxers.com/vibcraft-viborg-in-minecraft/. GeoBoxers generated Minecraft versions of the two limestone mines Moensted and Daugbjerg. The mines are located just west of Viborg in the northern part of Denmark. 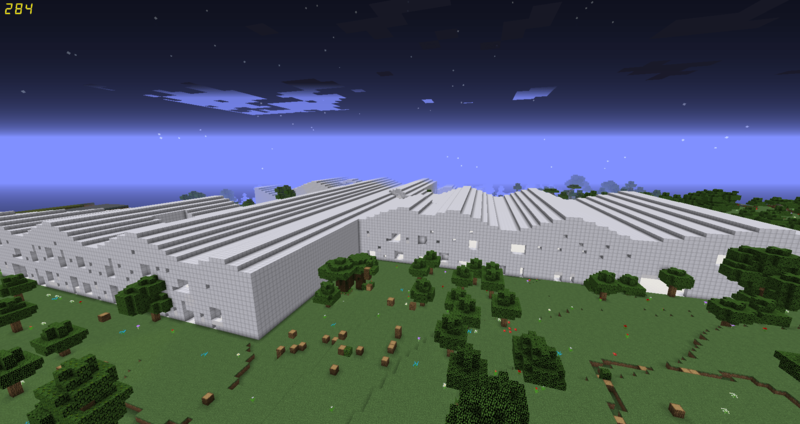 Moensted in Minecraft was created from on LiDAR point cloud data using statistical methods described in the blog post Statistical Mines. Denmark in Minecraft consists of 4000 billion blocks and was created by the founders of GeoBoxers. It doesn’t have to be on Earth to be created in Minecraft. GeoBoxers converted data from NASA and HiRISE into Mars Minecraft maps. The maps are free to download. And to celebrate the first Danish astronaut, Andreas Mogensen’s, mission to the International Space Station, GeoBoxers’ Mars in Minecraft was released together with a model of ISS in IRISSCraft. GeoBoxers worked with the international engineering company COWI on making a Minecraft model of the old Christian IV’s Brewhouse in Copenhagen, Denmark. This was done to demonstrate how point clouds from drones and handheld scanners can be shown in Minecraft. The building was made available for drone flying and handheld laser scanning by the Agency for Palaces and Cultural Properties. Try to twist the real world into a computer game, and you will most certainly face the same problems map-makers have dealt with for centuries! Here you can get insight into how we get a somewhat spherical reality into a flat playable world. Not all decision makers, planners and architects are Minecrafters. 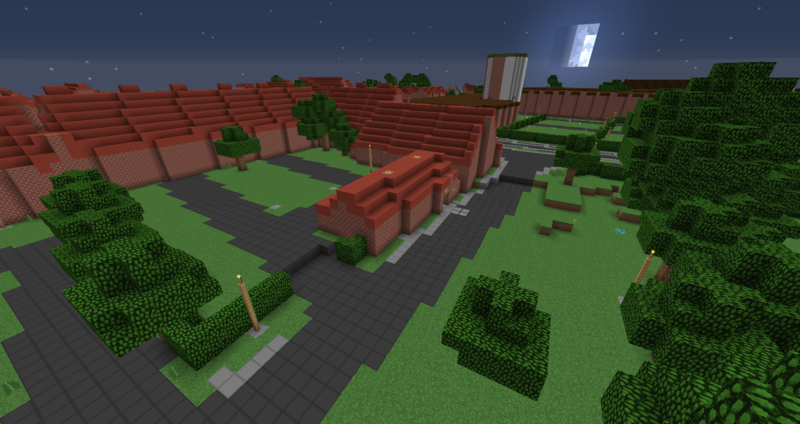 Therefore there is often a need to view user creations from outside the game, when Minecraft is used for urban planning and city design. As a consequence GeoBoxers make it easy to detect changes in Minecraft models and to show these changes in different ways, e.g. on a map in GIS. GeoBoxers received all kinds of geodata from the city of Viborg, and from there we created Vibraft. One of the most exciting parts of this job was modelling the world’s largest limestone mines: Mønsted and Daugbjerg. In this way, we brought real mines to Minecraft! You can see a technical overview of how the task was solved in this blog post. Making urban planning childs’s play. Connecting GIS and geospatial data with Minecraft. If you want to know more, then read about it here. “Minecraft is a game about breaking and placing blocks. At first, people built structures to protect against nocturnal monsters, but as the game grew, players worked together to create wonderful, imaginative things.” This is how Mojang, the creators of Minecraft introduce the game, https://minecraft.net/. Minecraft was first introduced in 2010. Since then it has gathered over 100 million registered users worldwide on different platforms. So far over 22 million people bought the PC and Mac versions of the game. You can choose to play alone or online with other users in Minecraft. You can play in survival mode, where you need to fight monsters. Or you can play in creative mode, where you can build and move around without creepers and monsters. It is necessary to buy a license to use Minecraft. If you want to play with others, then you can also choose to open your own server and invite others to join you in your Minecraft-world. Servers can be set up to meet almost any demand or restriction depending on the purpose. The server software is free of charge and can be hosted at almost any web service provider. GeoBoxers are experts in geospatial data. We excel in bringing large and complex geographical datasets into easy use as boxes and blocks in Minecraft. We are situated in Copenhagen, Denmark. Read more about us here.